We all need spaces of quiet and beauty in our lives, places where we might come apart from our “time-torn” lives and contemplate, reflect, and find sustenance for our souls. The Sanctuary at Woodville seeks to provide such an environment whether you are looking for 30 minutes or a whole day place for retreat, a workshop or seminar to inspire your spiritual life, spiritual direction, or prayer. We accommodate individuals and groups (generally up to 30 people) and are equipped to offer teaching in spiritual formation and spiritual disciples. If you would just like a place to bring a group and have your own agenda and teaching, we are pleased to offer the hospitality of space in The Sanctuary. Sanc-tuary: a refuge; a consecrated place. What we believe: At the Sanctuary, we seek to uphold all that is taught in The Apostles Creed as our basis for all teaching and the practicing of spiritual disciplines. Our main goal is to help each person thrive in their understanding and experience of The Triune God and to help them access more fully the Life of the God-head in the community, that community being the Creator, the Redeemer, and the Sustainer of our own life. Our souls are further sustained through the community of others joining us on this journey, either for a season or for our lifetime. Located just a five minutes walk from Lake Whitehall in Hopkinton, this facility provides a sanctuary for retreats and workshops in a rural setting, yet is a short distance from both Worcester and MetroWest. There are six miles of hiking trails around the lake. You can enjoy kayaking, canoeing, and fishing in the lake. Nearby are other walking options. Included in your usage donation for the facility are WiFi, USB wall ports (to charge your electronic devices), three drop down screens, LCD projectors, a full sound system, four kayaks, one canoe, a variety of life vests, and full fishing gear. A game and conference room with a ping pong table is available. The building is handicap accessible and child friendly. If you need a topic speaker for your retreat, we can help provide one. Room availability depends on your group size and concurrent facility usage. “Deep within us all there is an amazing inner sanctuary of the soul, a holy place, a Divine Center, a speaking Voice, to which we may continuously return. Eternity is at our hearts, pressing upon our time-torn lives, warming us with intimations of an astounding destiny, calling us home until Itself.” - A Testament of Devotion, Thomas R. Kelly. At The Sanctuary, we seek to uphold all that is taught in The Apostles Creed* as our basis for all teaching, the practicing of spiritual disciplines, and living our lives to declare God’s Glory. Our main goal is to help each person thrive in their understanding and experience of The Triune God and to help them access more fully the Life of the God-head in Community, that Community being the Creator, the Redeemer, and the Sustainer of our own life. Our souls are further nurtured, challenged, and sustained through the community of others joining us on this journey, either for a season or for our lifetime. As a church community, we seek to practice living as Christ’s emissaries in this world, learning to love others as Christ loves us, and proclaiming the Good News of His eternal Kingdom to all in thought, word, and deed, so that all may come to know the Living God in increasing fullness. We are intentionally non-denominational as our hope is to foster a larger Kingdom mentality of loving unity made up of a diversity of orthodox practices based on Biblical doctrine. Our view of the Judeo-Christian Scriptures is that they are fully inspired by God and infallible in their original form. As Christ’s emissaries, we thrive on the living word of God as illumined to us through the living Holy Spirit of God Who dwells within the Christ-follower. 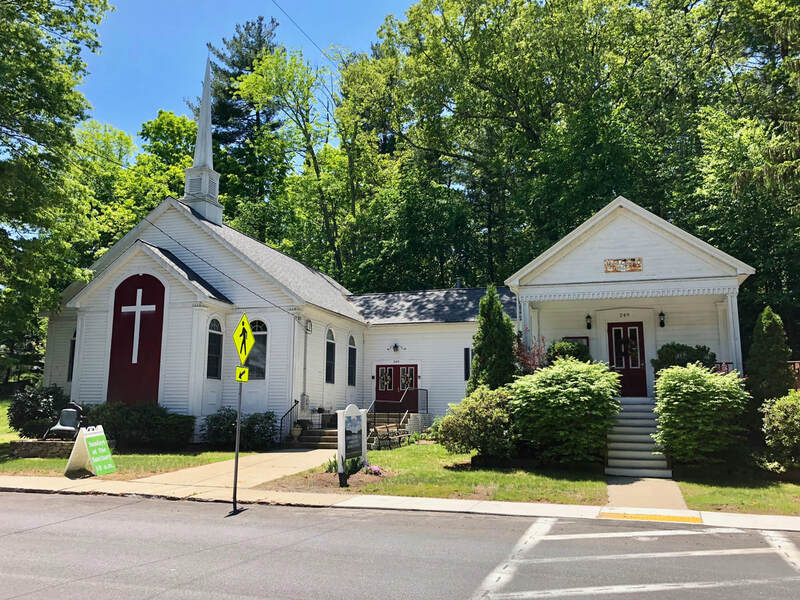 What others are saying: The Sanctuary is located in a lovely spot between Westborough and Hopkinton centers, in the village known as Woodville. In and of itself, this portion of Route 135 is like a step back in time, with simple houses lining the street, and this lovely little Baptist Church which is also home for the Sanctuary. Within walking distance of Lake Whitehall, the setting is nestled in pine trees, and has plenty of easy walking trails, not to mention paddle-boating opportunities. The Sanctuary is also fully handicapped-accessible.